The Fast and Furious series finale is weighed down by mundane dialogues and plot points, says Paloma Sharma. 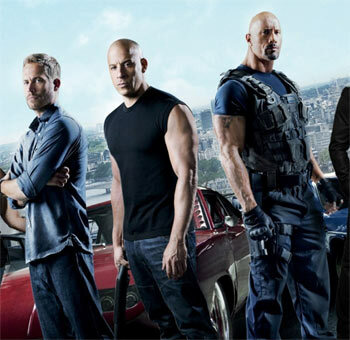 A globally popular film franchise that centres on tough guys with fast cars and big guns, the Fast and Furious series's final chapter is one gigantic nostalgia trip. Furious 7 sees Dominic Toretto (Vin Diesel) & Co back in Los Angeles after their antics in London. No longer wanted criminals, they believe that they are safe enough to lead normal lives. However, things begin to go awry very soon. Dom, who lives with Brian (Paul Walker), Mia (Jordana Brewster) and their son, watches his home get blown to pieces. Not long after, the crew learns that Han (Sung Kang) was involved in a fatal car crash that was no accident. Dom embarks on the near impossible task of taking down the shadow that is hell-bent on wiping out the crew, and (predictably) gets into a whole lot of trouble/adventure along the way. While the film does feature the fare that the franchise is famous for – zany cars, exotic locations and uncomfortably close shots of women’s barely clad backsides –- at its heart, Furious 7 is all about the family. This is something the protagonists will keep reminding you repeatedly, verbally and even through the soundtrack, until you’re cringing in your seat. Furious 7, being the final installment, tries to say everything it can before it says goodbye, which means that this film is overflowing with excesses. The run time is far too long at two hours and nineteen minutes, the subplots run wild, there is just too much drama and dialogue for an action film. While action movie skeptics often complain of the genre only concentrating on violence without much context, Furious 7 has too much context. Nevertheless, the film taps into the deep emotional connect between its characters which the series loyalists may find evocative. Dom and Letty's (Michelle Rodriguez) romance drags on through death, resurrection and amnesia only to end in one of the most clichéd scenes ever. Brian O’Conner and Mia go down a similar road. It is Tej (Ludacris) and Roman (Tyrese Gibson) who are delegated the responsibility of keeping things upbeat as the jokers of the pack. Despite all its flaws in every other department, Furious 7 means business when it comes down to the film’s forte -- it takes its stunts to the next level. Strip Furious 7 of mundane dialogue and barely believable plot points, and it is sheer awesomeness. Bollywood actor Ali Fazal's strained attempt at a Middle Eastern accent is just as embarrassing as Australian rapper Iggy Azelea's awkward cameo. In the end, despite its shortcomings, Furious 7 works more because of the people behind the screen than those on it. Director James Wan and screenwriter Chris Morgan expertly work around cast member Walker’s untimely demise (the 40-year-old Fast and Furious regular passed away in a car crash in 2013) and incomplete performance, their vision being brought to life by stunt doubles and CGI. Furious 7 is more of a montage of fond memories than it is a movie. Largely entertaining but not necessarily everyone’s cup of tea; as far as this one is concerned, you come for the action and you stay for the drama.